The oscillating multi-tool is the workhorse of detail work. Multi-tools make tasks like tile removal, detail cutting, and precision grinding easier. Oscillating multi-tools get their force and functionality from the short rhythmic movement, or oscillation, the tool head produces. Detail work is a favorite task for oscillating multi-tools because the limited range of motion in tool oscillation produces very slight kickback to the user. We used to just have oscillating tools on the market which either cut or sanded, but now the many purposed oscillating multi-tool is the standard in the market. Any oscillating multi-tool you purchase should have the ability to cut and sand material. If you have a particular interest beyond cutting and sanding make sure the tools you consider have the attachments you need. Don’t go too flexible if you don’t need it. If you don’t have a need for 20+ attachments then buy a simple oscillating multi-tool first. All the major oscillating multi-tool makers produce a variety of aftermarket attachments you can add to your collection if and when they’re needed. What to Look For : Cordless or Corded? This comes down to personal preference and what your need is for the oscillating multi-tool. If you know you will be working near an outlet 80% of the time then go with corded for your oscillating multi-tool. Corded oscillating multi-tool are generally cheaper, lighter, and don’t rely on an expensive to replace battery. There are many good quality cordless oscillating multi-tools available on the market. They’re a great option if you need cordless due to your location or work environment, but don’t expect many cordless oscillating multi-tool batteries to last through more than half a day of continuous use. Oscillating multi-tools are the type of tools that projects rely on. You will undoubtedly use your oscillating multi-tool often and depend on it working for years to come. If you want longevity out of your tool you must do appropriate research before you purchase it. Oscillating multi-tools can be expensive and you need to make sure you do not waste money on a tool that will conk out in three years. Honest feedback about reliability in a tool will only come from consumers. If you want to learn what tool is the best option for durability you will need to consult user feedback about the tool from online reviews, friends, and blogs. Read the good and bad opinions, but keep in mind that most people don’t take the time to post good opinions. The Bosch brand has always provided reliable corded power tools, and the response from users of this tool kit is overwhelming positive regarding durability. The Bosch Multi-X Oscillating Tool Kit comes with all the essential attachments at a price point on par with many inferior competitors. Bosch makes every attachment type under the sun for their oscillating multi-tool; so, you’ll have no problem finding any specialty attachment you may need. The Bosch Multi-X Oscillating Tool Kit is a great choice if you plan to use your oscillating multi-tool a few times a month and you expect it to last you a high number of years. The German manufacturers Fein invented the oscillating tool and they remain the industry standard for oscillating tools to this day. The Fein Top MultiMaster Oscillating Multi-Tool leads the market in positive user feedback and professional feedback from awards and ratings. Fein has built their name by producing accurate and durable tools for years and the Fein Top MultiMaster Oscillating Multi-Tool follows legacy with great ergonomics, an all metal internal construction, and a powerful 3.2 amp motor. Fein also leads the oscillating tool attachment market in ingenuity and longevity. The materials used for their attachments are simply better than their competitors. Fein’s sanding pads are sturdy and their carbide construction bits are the strongest available. If you need an oscillating multi-tool and you want to buy a tool on the low-end of the price spectrum the Chicago Electric Oscillating Tool is probably your best option. The Chicago Electric Oscillating Tool provides a solid two amps of power and comes with all of the basic accessories you’ll find in a oscillating multi-tool kit. The Chicago Electric Oscillating Tool gives you the power of an oscillating multi-tool without taking too much out of your wallet, and it is the most reliable oscillating multi-tool in its price class based on consumer feedback. If you plan to use your oscillating multi-tool only occasionaly, or you want to purchase a very low priced oscillating multi-tool, the Chicago Electric Oscillating Tool is your best option. Posted by Scotty Burrell. This entry was posted in Oscillating Tools. Bookmark the permalink. 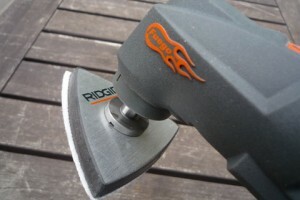 « Should You Buy a Combo Kit of Portable Power Tools?